The bears may be hibernating, but winter is when the skiing comes alive in the Canadian Rockies. In the big Canadian Rockies national parks reside several ski areas. Today, let’s look at where to ski in Banff National Park, Jasper National Park’s neighbor. The legendary Lake Louise Ski Area is one of the biggest ski areas in North America. On a clear day, the surrounding Banff National Park scenery on its 4 mountain faces is so spectacular that a skier may have a hard time concentrating on skiing! 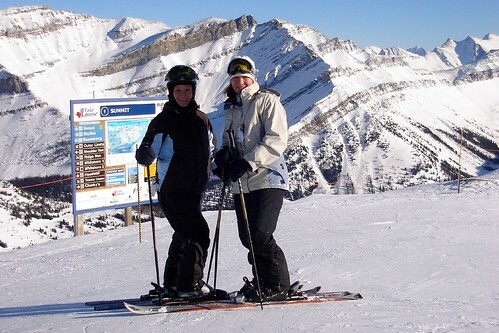 Lake Louise Ski Area is a place to find top-notch ski instruction. Think about it. If you are a ski instructor, where would you want to work most? Lake Louise is one of the biggest places around and draws top talent. After a day skiing at the Lake Louise Ski Area, a good skier will need a recharge. Luckily, a day spent skiing can be rewarded with a meal at one of the restaurants. Recharge at the Sawyer’s Nook which serves 12 inch organic pizzas like the Grizzly (pepperoni, mushrooms, red & green peppers & mozzarella). That’s the way to recharge! The Lake Louise Ski Area’s website boasts that the famous Banff ski area has “more terrain than can be skied in a week.” That’s a lot of terrain. More specifically, there are 139 named runs on 4200 skiable acres. The Sunshine Village in Banff National Park has 12 lifts covering 3 mountains (Goat’s Eye, Standish and Lookout). Getting on top of the world is only 20 minutes from the town of Banff. The season runs from mid-November to the end of May – depending on the weather. The resort offers a variety of certified ski instruction options. Sunshine Village ski center in Banff has 107 named runs. See the Sunshine village website for the latest rates and hours. View live webcams of Sunshine Village here. Follow Sunshine Village on Twitter. I do. Mt Norquay’s tagline is “Banff’s Best Family Resort” and is a mere 6 km from downtown Banff. For those who want to learn to ski or learn to be a better skier, Norquay offers certified ski instruction for all levels. Offering skiing, snowboarding and tubing means Mt Norquay is fun for everyone. The season is a little shorter (early December to mid-April) than the other 2 Banff ski areas but Norquay can boast the only night time skiing (Fridays only 5:00pm to 10:00pm Jan 6th to March 31st) in the area. Skiing on Mt Norquay at night is a fun way to spend the evening if you just cannot get enough of it. Mt Norquay has a good mix of beginner, intermediate and advanced terrain, and even some expert terrain. The Mt Norquay website has the latest information on rates. Question: Where is the best place to ski in Banff National Park? Answer: As can be seen from the videos, the answer to “where is the best place to ski in Banff National Park?” is an easy one. If you are in Banff and you are skiing, you are in the best place to ski. No matter you skill level, you can go to any of these places to have a great time. You just need to get there!